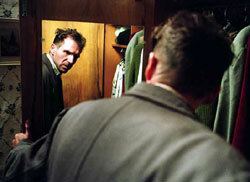 New interview with David Cronenberg about "Spider." 1999 David Cronenberg interview for "eXistenZ"
The uncanny Cronenberg moodiness always translates well to the small screen, and the incredible performances here will absolutely leap off the screen. But you might want to watch it with the volume turned up a little so you can make out some (if only a little) of the main character's inward mumbling. David Cronenberg's "Spider" is a mesmerizing immersion into the precariously unstable mind of a psychiatric patient who has just been released after 20 years in an asylum. Living in an orderly but cavernous and colorlessly dreary halfway house in the empty industrial corner of London where he grew up, the haggard, misshapen man in his 30s begins a journey -- into his past and deep into his own mind -- that threatens the tenuous grip on reality that earned him his provisional freedom. The director's preternatural talent for uncanny atmospherics permeates the film from its very first frames -- the opening credits run over Rorschach-test-like images of the peeling paint on the halfway house walls. But "Spider" is dominated by a few extraordinary performances with the ability to stir visceral reactions from beginning to end. Ralph Fiennes plays the nicknamed title character, whose inaudible compulsive muttering serves as an unnerving soundtrack to his disquieting internal trepidation. Even more macabre than he was as a schizophrenic serial killer in last year's "Red Dragon," the usually handsome actor adopts warped posture, anguished features and dreadfully taut hands to help create a sympathetic yet puzzling character. Spider is hanging onto reality by a thinner thread than the swathes of twine he habitually stretches around his room in a curious asymmetrical web. Almost entirely out of sync with the bewildering world around him (Cronenberg disorients and alienates with fisheye lenses, angled ceilings and other visual elements), his mind is soon reeling back into details of the childhood trauma that landed him in the sanatorium to begin with -- the murder of his mother. The other mind-blowing performances are by Lynn Redgrave and by Miranda Richardson -- who occupies several roles in the film which symbolically manifest the fragmentation of Spider's mind. But because Richardson is almost unrecognizable -- to an astonishing degree -- from character to character, I will not identify which roles she plays here, because that realization is part of Spider (and the audience) deciphering his distorted psyche. As he slips in and out of recalling and recreating the shocking events of his childhood, Spider madly scribbles cryptic gibberish in a secret notebook -- evidence of his destabilizing, dream-like investigation. Appearing invisibly in the corners of his own memories, the unhinged adult Spider watches himself as a child, imagines himself following as his blue-collar father (Gabriel Byrne) frequents a local pub far too frequently, and watches as dad picks up a malicious, aging tart who toys at playing mummy to the boy after his real mother's death. Slowly Spider's fragile grip on the present begins to slip, leading one to wonder how much of the past we're seeing is imagined as well. While there's a chance he could emerge victorious from this battle with his own demons, the halfway home's other rickety former patients and its compassionate but impatient, austere housemother -- who bears the mistaken-identity brunt of Spider's reality-blurring -- are hardly the right people to help. Creating an almost entirely vacant world as seen through Spider's eyes, Cronenberg (who added his own ideas to author Patrick McGrath's adaptation of his 1990 novel) shot this film in concave spaces and emptied streets, where the local gas works could loom ominously out his hero's window, prodding certain suppressed memories that at first manifest themselves as gas-leak paranoia. The picture's enriched, riveting performances spring forward against this backdrop, as do the characters themselves. Before Spider ever mumbles a word (he has only a few lines of comprehensible dialogue) his old, scuffed shoes, his five layers of shirts, his ratty suitcase and cowlicked hair present a vivid characterization when combined with Fiennes hunched neck and strained shuffle of a walk. While "Spider" does not contain the same creepy body themes that have become synonymous with Crononberg's work ("eXistenZ," "Crash," "The Fly," "Dead Ringers") his style is ideal for instilling the film with the intuitive air of fear and volatility that Spider forever struggles to keep at bay. An emotionally compelling puzzle seen largely and effectually from inside this unsound character's head, "Spider" is one of the director's best, most measured works.